All of these shears and razors are nice quality for cutting hair - if you're cutting synthetic wigs with these remember that the plastic of the wig fiber will cause them to dull much faster. Thinning shears are a great way to thin the hair for hair that may be too thick for the desired style, and for when you don't want to razor cut. These have nice action and do the job nicely. 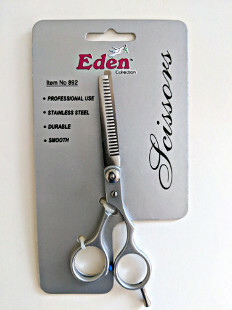 6 1/2 inch stainless steel shears. The 'ice' doesn't refer to anything except the fact that they're kinda wicked slickery and that can feel pretty nice when you're cutting hair/wig fiber. Snippity snippity! Double-sided comb with a razor in it, to remove small amounts of hair, you comb gently through your hair or wig and little hair/plastic fiber bits are removed! Double-sided and can be re-razored!